Synopsis: When the underwater civilization of ::sigh:: Seatopia gets fed up with our nuclear testing, they send their protector Megalon to the surface to exact their revenge on us. Power Rangers was a franchise that was a big deal for most nerds of my age who grew up watching the adventures of spunky, goody two shoes teens that also get to pilot a huge transforming robot to defeat huge monsters. In the show, as some people know, the robot and monster scenes were all taken from Japenese shows and then spliced together with the scenes of the American actors. And with GODZILLA VS. MEGALON, it sure feels like I was watching the inception of that concept. The movie manages to have some crazy elements to keep it interesting while retreading a rather tired story line. Let's get the lame stuff out of the way, the movie has actually managed to grind one of my favorite Godzilla plots to the ground, and I actually hope that it goes away for a while. The plot is the alien invader using conspiracy and kaijus in order to enact some plan against us surface-dwellers. This time, the "twist" I guess would be that the invaders are actually from under water from the underground kingdom of ::sigh:: Seatopia. They are legitimately annoyed at all of the nuclear testing the above ground types have been doing. So they do the only legitimate thing that you do and summon your benevolent cockroach/drill armed monster god to mess stuff up in Tokyo. Generic human characters, in the meanwhile, have invented the aptly named Jet Jaguar, a robot capable of doing something, we just don't know what, it's never explained. But the Seatopians use him as a way to guide Megalon to Tokyo because obviously there is no other way of him to know one of the largest cities in Japan. This means that of course, the humans have to get him back and use him for good or to summon Godzilla. You have to have the obligatory human b-plot with them trying to go on goofy adventures to retrieve the robot. I won't lie when I say that this is a super cheesy movie, but once again, the fights at the end redeem the movie even if Godzilla takes a bit of a back stage to Jet Jaguar. And his suit has once again changed. His snout appears to be bigger, his green is a little more forest green, and for some reason, he can now apparently communicate via very goofy sign language and gestures. I don't want to sound insane, but given that this is the first time that Haruo Nakajima does not portray Godzilla, I was a little wary on the new guy, Shinji Takagi. I'm not sure if it was his performance itself or just the choreography. What bugged me is that once again, they mention Monster Island which, according to my records was created at the end of the 20th century, was being used as a setting for Godzilla's home, and yet the opening narration alludes to a 197X setting. Jet Jaguar is probably the most advanced robot ever created in the late 70's because he can apparently grow to the size of Megalon to fight him. Oh, and he also gained sentience for some reason, too. The Power Rangers comparison that I mentioned before was due to the fact that once he fights Megalon, the movie deteriorates to a Power Rangers-esque cheesefest. For some reason, the Seatopians have access to Gigan so they call to him to help Megalon. The fight moves are very ridiculous and the choreography is the opposite of subtle. 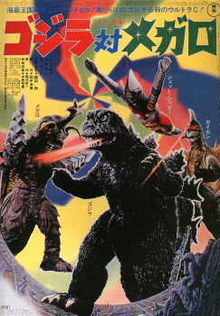 Once, Godzilla arrives, we get a more ridiculous tag team situation with Jet Jaguar and Godzilla vs. Gigan and Megalon. At this point we have the villains high-fiving each other, Godzilla moving in ways that looked way too human, and once again the over-use of previous stock footage. The biggest take away from GODZILLA VS. MEGALON is just how goofy and comedic the series has become and how this has been one of the lower points of the franchise so far. If my reviews are starting to sound a little repetitive, it's because the movies themselves are actually becoming just remakes, remixes, and almost reboots of the first five movies in the series. At this point in the history of Godzilla, the first era, Showa, is about to be over, and I have to say that for the sake of the series that I’m glad it will be going away for a while.